We met her for the first time at the annual Doelen Spring HiFi Show in our hometown of Rotterdam, in one of the more hidden rooms tucked away from the rest of the exhibits. There she hid somewhat from the crowds. From a corner, she stared at us. Her big brown eyes made an indelible impression. The sparkle of light there in the middle of that mischievous glance gives away her lively personality. Her slender body is well proportioned. Without being intrusive, she radiates classic beauty - classic in the sense of timeless elegance. The way she addresses us is mesmerizing from the start. Even without knowing her better, there is instant ignition, a sudden cohesiveness. As she reveals more and more of herself during our brief first encounter, the desire to get to know her better grows and grows. We try to make an appointment. She does not say no directly. She holds back. Later, much later she will contact us. With mixed feelings we have to say goodbye for now. On the one hand, there's regret for having to leave her behind; on the other hope for a reunion persists. She will contact us. Hope says so as desire grows. Then we boldly contact her. Such an initiative can bounce back when perceived as pushy. Alas, we're lucky and she agrees to make an appointment. She will come to us for a closer acquaintance. The days to follow pass by slowly. Even though she does not have much time, we want to make her visit as pleasurable as possible. We prepare and assemble all manner of things just to please her when she comes. Our excitement grows as the day of her visit approaches. The day is here. The doorbell rings and she's behind the door. She is of course Glennie as we have christened her informally. Her full name is Tannoy Glenair and she is a member of the Prestige line of the Scottish Tannoy loudspeaker family. Being the youngest offspring, she's definitely outspoken. The other members of the Prestige line feature a distinguished, sober classic look. With their exteriors finished in sedate walnut veneer and with grill cloths in typical Anglo-Saxon tweed, they can blend in any classically understated home decor. Glenair distinguishes herself with a nice light Cherry finish. This gives her a fresh and elegant stature. Her presence is also different from other Prestige members by not being a square box. Glenair has a trapezoid shape, with the rear panel less wide than the front baffle, hence tapered sides. Not only are the most severe internal standing wave modes scattered, Glenair appears smaller than she really is. It's like a model doing the stop on the catwalk. Fortunately Glennie shares other typical Prestige characteristics such as transducer configuration. From the smallest Mini Autograph to the immense Westminster Royal, all use a dual-concentric driver. Lucky for her, Glenair is equipped with a massive 15-inch/38cm unit. Fifteen-inch dual concentric loudspeakers remind us of days gone by - the period before transistors ruled and tube amplifiers of a handful of watts had plenty of power to drive high-efficiency loudspeakers. With an output of 95dB at 1 meter from a single watt , Glennie's the sensitive type. A humble 300B-based 8-watt amplifier has enough oomph to party. 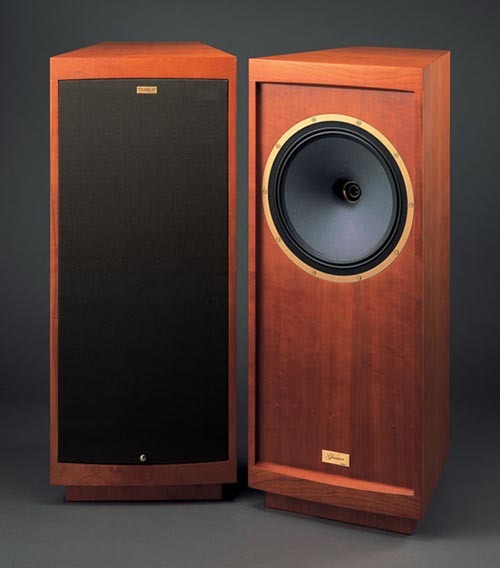 While Tannoy has remained loyal to high-efficiency loudspeakers, that came with a cost. Glenair however signals a turn of the tides price wise. For a very reasonable price in Europe at least, you can acquire an authentic Tannoy Prestige transducer doing 15 inches at 95 miles an hour - oops, 95dB/1w/1m. Dual concentric describes a driver where the tweeter sits inside the middle of the mid/bass unit. This avoids stacked vertical arrays that place one driver above the other. You can easily spot the tweeter of Glennie as the shiny sparkle in her huge eye. The way Tannoy has perfected its coaxial transducers disables undue driver interactions. 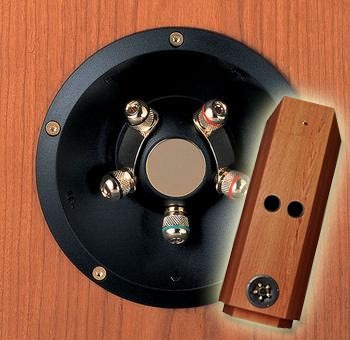 The tulip-shaped waveguide of the tweeter acts as quasi horn to focus high frequencies. Here's the strong point of a dual-concentric design. All sound propagates from one singular point in space rather than from various origins in a vertical plane. Being a point source, the listener experiences sound as very coherent and natural. A singer's voice comes from her voice box and mouth which sit at a certain height. Her throat does not relocate to a lower point when her voice drops nor rise when she sings a higher note. Even though a dual-concentric design is capable of excellent integration, a crossover remains necessary to define the transition between both drivers. For the Prestige line, Tannoy relies on the simplest possible network design. A Hovland capacitor and an oversized coil are all that separates the big unit from the tweeter. The Scotts also considered their hookup wiring - Acrolink silver-plated pure copper. Simplicity and quality are the leitmotif. Time for Glennie to get undressed. Once in full naked splendor in the soft sunlight of the listening room, we can admire her fit and finish. Cherry wood has that internal warmth which suits nearly every style of interior. The tapered shape nicely disguises the real size of 1.05 m high, 46 cm wide and 45 cm deep. Her weight of 45 kilos is unproblematic as she slides smoothly across the carpet on four gliders. Once in her preferred spot, four black cones may be used to enhance floor contact. In case of delicate flooring, a number of discs can help protect it. Connecting Glenair from the back, bi-wiring is the way to go. Next to two pairs of heavy connectors, an unexpected fifth in the overall star formation provides grounding. Tannoy's own loudspeaker cable, aptly dubbed TLC, is equipped with a fifth wire for this grounding purpose. Working on Glennie's hind side, we find two ports to vent two internal compartments. Through one of the ports, the good-sized coil and capacitor of the crossover are clearly visible. To start, we place Glennie roughly 50 cm from the front wall and a fair distance from the side walls. At 95dB, she is a good candidate for the Audio Note Meishu's 8 watts. 'round front, we have to make a decision: to veil or not to veil. The veil in this case is the brown-and-gold grill. The cloth on the grill is some sort of woven metal wire and strong indeed. We go for the full Monty. The grill magnets hide behind the baffle veneer to help to give Glennie her unmarred smooth looks. With the first CD in the player, we give it a go, looking Glennie fully into those big brown eyes, with that special glimmer of the tweeter smack in the middle. From the first notes it's clear that this Tannoy not only oozes visual but also musical relaxation. The full depth of an acoustic bass is presented without problems by that giant paper-pulp cone. Midrange tones, our most critical frequency range, benefit from the same naturalness and Glenair's capabilities to handle dynamics are impressive. The Scottish designers managed to craft their driver combo in such a way that it never gets into trouble even at high SPLs. 'Modern' hard cones of smaller Kevlar or metal diameter are no comparison to old-fashioned huge paper pulp cones whose big magnets and voice coils in conjunction with the cabinet dimensions keep it under control. music. We started with smaller acoustic settings before we opening the drawer on some heavier works. Glenair handles Hendrix, Zappa or Miles live with ease. When we switch amps and use the Meishu as preamp for the MOSFET/tube hybrid Moscode 401HR in for review, the party really starts. With 200wpc on tap, our ears give out before Glennie signals even a wrinkle of distress. Big classical orchestral works pose no threat nor does modern dance with its pounding electronic bass monotones. If dynamics are encoded on the recording, Glenair unravels them and brings them to life. For best results, we used a toe-in of around 8 degrees and the initial half-meter distance from the front wall proved a good guess for a rear-ported system. Glenair is a loudspeaker that continues the great Tannoy dual-concentric tradition in a modern package. At a very reasonable European price, you get a modern classic suitable for all kind of music. The natural representation, the dynamic qualities and the point-source design guarantee hour upon hour of musical delight without ever becoming tiring - but Glenair likes to be charmed with equally classy ancillaries. Bye Glennie, hope to see you again soon!